Grantham University is honored to offer the Commander Everett Alvarez, Jr. Resilience Scholarship for all eligible military students currently using their military Tuition Assistance (TA) benefits. Commander Everett Alvarez, Jr., U.S. (Ret.) Navy, was the first American aviator shot down over North Vietnam, spending eight and a half years as a Vietnam POW. He credits his determination and persistence in the midst of life’s most difficult situations to the fundamental principles he learned in the military: You don’t give up. You stand true to your mission. Be resilient. 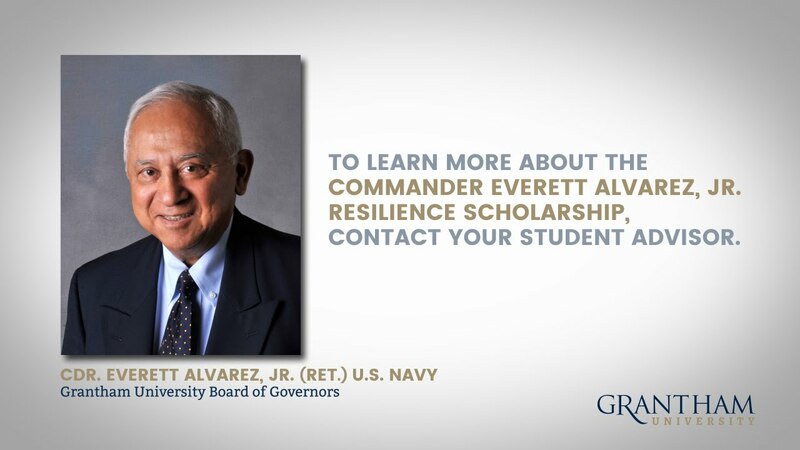 Commander Alvarez currently serves on Grantham’s Board of Governors, and we are honored to provide this resilience scholarship opportunity in his name. Through the Commander Everett Alvarez, Resilience Scholarship, qualifying service members are provided up to $1000 annually toward their Grantham degree. Applicant must be a member of the United States Armed Forces. Applicant must first exhaust all of their allotted fiscal year TA benefit. If TA has been exhausted at an institution other than Grantham, the student will be required to provide documentation verifying all TA for the current fiscal year has been exhausted. Applicant must meet minimum admission requirements at Grantham University. If a current Grantham student when applying for initial use of the scholarship, they must also have a cumulative GPA of at least 2.0 be in good standing academically. Applicant must submit an original 100-word essay to their Student Advisor via email about his/her vision of college education and how he/she plans to use that visualization to stand resilient in the face of obstacles or adversity. Recipient must maintain a cumulative GPA of at least 2.0 and be in good standing academically (no max time issues). Recipient who maintains eligibility throughout his/her degree program and continues to exhaust his/her TA benefits annually at Grantham, is eligible to be awarded the scholarship for subsequent years without needing to reapply. To apply, contact your student advisor or call Grantham University at (888) 947-2684. Military students should apply as early as possible once a new fiscal year starts (October 1) to ensure their acceptance and award letter is on file. Students seeking to apply for the scholarship will submit to Grantham their personalized essay and documentation showing their TA has been exhausted. The applicant must meet all initial eligibility requirements. The scholarship application, along with all documentation needed to prove eligibility, must be received within the fiscal year in which the applicant has exhausted their TA. Selected scholarship recipients will be awarded the scholarship contingent upon maintaining the eligibility requirements before the Commander Everett Alvarez Resilience Scholarship takes effect. Applicants will be notified of the Scholarship Committee’s decision via email approximately 30 days after the scholarship application. The scholarship must be applied to a future course within that same fiscal year in which it has been awarded. NOTE: The scholarship will only cover the cost of tuition for courses required for the recipient’s chosen degree program at Grantham University. Courses outside of the degree program may be taken, but at the expense of the scholarship recipient. The race, gender, ethnicity and age of scholarship applicants are not considered in the awarding of scholarships.